Thanksgiving Prep (Before the Groceries!) — the nineteen sixty. I’m sorry but I need to chat for a minute before we get into the blog here. Can you believe Thanksgiving is almost here? It just absolutely blows my mind how this year has flown by and I truly understand why people tell me to enjoy being young and value the time I have. There are many things I am thankful for this year - many more than I can say I had last year. Last year at this time I had recently left my job over something I felt was more important than my superiors did and I was starting in a new company at the bottom. I had no idea what was going to happen to me and I thought I was hitting a low for 24. I had no idea at the time that I had done the most important thing I could have done and I was now in a place I was going to feel more at home in than I had felt in a long time. I am so incredibly grateful for my new job and the people it has brought into my life. I am so grateful for my family and the circle around me because even if I don’t see some of them for months I know I’ve always got someone in my corner. I’m also grateful for my health and the education I have had on plant based lifestyles. I go into the new year with great goals for continuing my transformation. This past year has been so incredible and I am looking forward to each spectacular moment of the upcoming holiday season. I love decorating, hosting, cooking and baking, and the extra sparkle that is in the air so a Thanksgiving gathering is the place to start. This year we are continuing our new tradition and hosting an almost entirely vegan Thanksgiving dinner at our house. Some guests wish to have turkey so aside from the turkey all of the sides are completely vegan and gluten free! Check back on Wednesday to take a peek at our menu. I have a few recipes from some amazing bloggers I follow but I also have recipes of my own to share! We just taste tested the casserole recipe I created and everyone loved it! For this week though I want to share with you some little things you can do to up your Thanksgiving game that are easy, fast, and inexpensive. 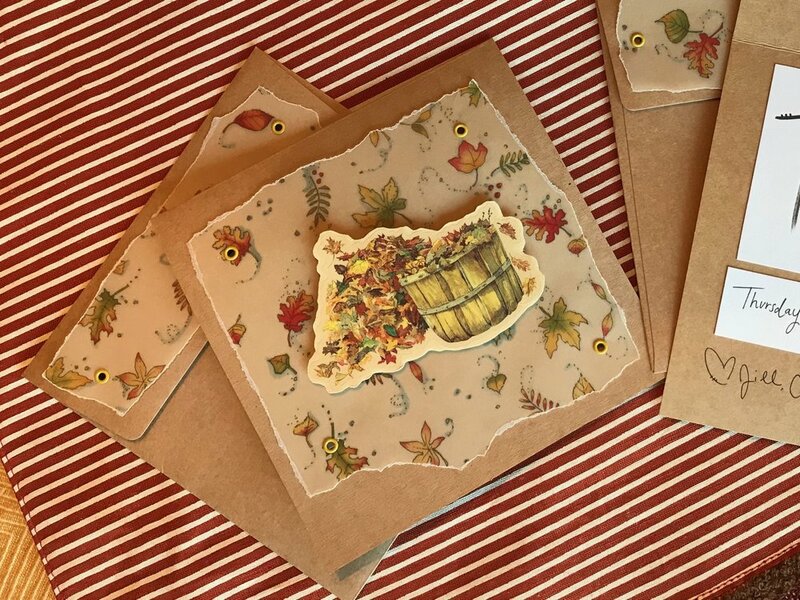 Whether you craft a quick note card yourself or buy a few at the store you will feel like the best hostess/host when you send a personal invitation to your guests. We made invitations quickly with some leftover paper and stickers we had in the craft bin but you can find these supplies at a craft store pretty inexpensively - plus you can always find a coupon in the paper or in their app too! Sending out invites makes you look and feel like a pro party planner and also adds a level of excitement to your gathering for all of your guests. I know it always makes me feel better going into a big meal when I have planned out exactly what I need to do. A couple weeks ahead of time I like to pull out my baking and serving dishes to see what exactly I’ll be using to serve my food. I try to have dishes that are easy to bake in, serve in, and clean up easily. While I love cooking the meal, doing dishes can be a drag. If I can bake in a dish and then serve the food directly from that then you betcha I am going to! Of course I want the dishes to all collaborate nicely so my table looks Pinterest worthy so I try to work that into my planning as well. Planning out what dishes you’re going to cook in is just as important as figuring out your menu for your Thanksgiving feast! Now you are probably going to argue that cleanup is way easier with paper napkins and if you don’t already own cloth napkins it may initially be cheaper. I’m going to argue back because using cloth napkins on your Thanksgiving dinner table steps up the entire aesthetic. You take your table from satisfactory to exceptional. Your guest will feel as if they are eating at one of the finest restaurants in the city. Pair cloth napkins with your favorite plates and somehow it makes the delicious food taste even better - like magic! If you have china you like to use that’s awesome! In our house we have a variety of old vintage plates we like to mix and match so we pair a plate up with each person to give them a little something personal at the dinner table. The last DIY prep thing you can do to step up your hosting game is to make place cards for all of your guests. There are countless ideas on Pinterest and various other DIY blogs but here’s what I did this year! I made paper pumpkin pie slices and tied a small tag with one of the guests’ names. I had seen a garland on Pinterest that had a few different pie slices hanging from it and thought it was cute but I really didn’t have a place for a garland. Voila! I had the idea to just do the pumpkin pie slices (they were the cutest ones) and make them into my place cards. And then to step it up a notch I put a magnet on the back so that they double as adorable refrigerator magnets afterwards! Last year we went super simple and earthy and I simply rested a handwritten name card in a pinecone and left it at each place. Like I said you can find countless ideas on Pinterest so go find one that suits your table! I made mine from materials I already had so this shouldn’t have to cost you any extra unless you need to buy a few supplies. Place cards make your guest feel important and add to that entire aesthetic you want to achieve when hosting! There you have it! 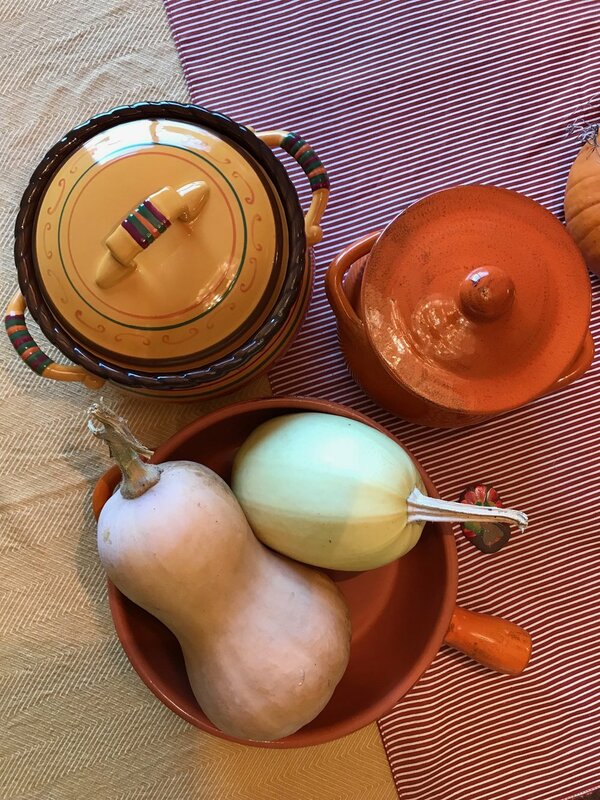 Those are my four tips for stepping up your Thanksgiving dinner before you even have your grocery list made! The next two weeks I will also have a Thanksgiving post for you. Next week I will be sharing our Thanksgiving menu with links to the recipes I’m using or I’ll share with you my personal recipe I’m using. Of course it will be a vegan and gluten free meal so if you need any dishes that are delicious and unrecognizable as vegan then check back on Wednesday! The following week I have vegan and gluten free desserts!! I’ll show you what we are having for our sweet tooth after dinner so you can make it at your gathering or throughout the holiday season! We’re going a little untraditional with the Thanksgiving desserts at our house this year so get ready! Remember to be kind and gracious as we head into this holiday season. Cashiers, drive-thru associates, and sales persons are all human with emotions and families. Don’t treat them any less because you are feeling rushed or pressured.